The following story is true. Only the master’s name was changed to protect the individual. We received our first snowfall shortly after I retired. While sleeping late and thoroughly enjoying the experience, the phone rang at the crack of dawn and I heard a voice say “Hey. Ready to go grooming”. I thought about mumbling something like wrong number, unplugging the phone and going back to sleep; but a little voice reminded me that I had said that I would go grooming after I retired. 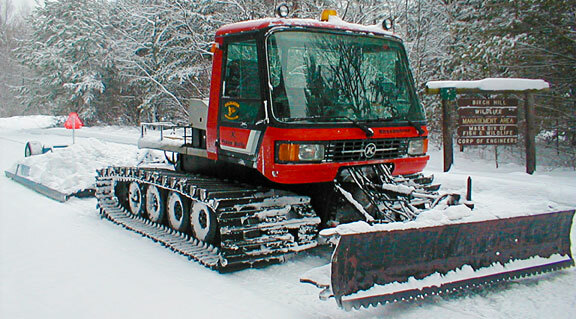 We fired up the old Thiokol Super Imp and headed up the mountain where the master began demonstrating the proper grooming techniques. He pointed out each and every rock and told me that I had better memorize their exact location so I wouldn’t scratch his precious drag. After lunch we continue down the trail with the master driving. There was a clunk and my door handle fell off onto the floor. I picked it up and looked at it in amazement. “Just push it back on” the master’s voice said, “You got to learn to handle emergency repairs in the field.” Upon further examination I realized that the outside portion of my door handle and locking mechanism had fallen completely off of the door and was now buried somewhere back up the trail under tons snow. “Got it”, I said, figuring that eventually I would think of something clever to tell the master about the missing outside door handle if we ever made it back. Soon the master remarked that it was time to head for home. Not wanting to sound too eager to return, I said “How about a couple more secondary trails on the way back?” I never figured he would actually agree; but I was wrong and we turned down an ungroomed secondary trail. As we groomed down a long steep section, I heard a groan from the master as he said, “Look, there’s a tree down completely blocking the trail.” Now, since we can’t back up or turn around, out comes the chain saw and we go to work clearing the tree. The master is either very frugal with the clubs chainsaw gas money or he feels only wimps cut a tree into easily liftable size pieces. The powerful chainsaw sits idle on the ground as we lift and lug ten foot sections of tree trunk off of the trail. After much backbreaking work, the job is complete. I figure now comes the lecture about grooming too many trails when we were supposed to head home. Luckily, the master remains calm as we continue down the trail. About one minute later we round a corner and there’s another downed tree across the trail. The tree removal process is repeated. Our nice groomed trail soon turns into a plowed road. “Darn, looks like they’re logging in here. We never should have come down this trail.” We stop for a short break. The silence of the snow-covered woodlands is suddenly shattered by the sound of a powerful diesel engine. A massive, fully loaded double trailer logging truck is roaring down the ice-covered road, just around the corner from where our groomer is stopped in the middle of the trail. I never knew the master could move so fast as he ran down the road. It certainly took a lot of raw courage for the master to jump in front of the logging truck madly waving his arms in a desperate attempt to save his beloved groomer from collision damage. I couldn’t bear to look; but I finally peaked out from behind the big tree where I had sought refuge. Luckily, the truck driver managed to stop his big rig just in time. The master had saved the groomer. As we start down the last several miles of trail, the groomer engine suddenly stalls. I hold my breath and turn the ignition switch. It restarts. The engine continues to cut out unless I hit the gas and we speed up. Unfortunately, the trail home is mostly downhill, very twisty and slippery in a number of spots. “Hey, slowdown” the master says. I barely hear him as I concentrate on only one thing – getting out of the woods without having to hike for 5 miles. Our average speed steadily increases as I slide the groomer and drag around the tight corners. I’m really starting to get the hang of maneuvering the beast when I notice that the master has stopped fidgeting with the drag and is holding onto the roof and the side of the engine with both hands. His knuckles are white, he is holding his breath and he is silently praying.